WICHITA, Kan., Feb. 21, 2019 /PRNewswire/ -- Aerion Corporation and Spirit AeroSystems [NYSE: SPR] announced today that they have entered into a collaboration agreement for the preliminary design of the AS2's forward, pressurized fuselage. "Joining a project team this early allows us to apply our technical expertise and commercial best practices to make the most positive impact," said Tom Gentile, President and CEO, Spirit AeroSystems. "We can create cost-efficient, innovative engineering solutions that take into account Spirit's highly efficient manufacturing processes. We are proud to be selected by Aerion for this program and look forward to contributing to the success of this groundbreaking new airplane." 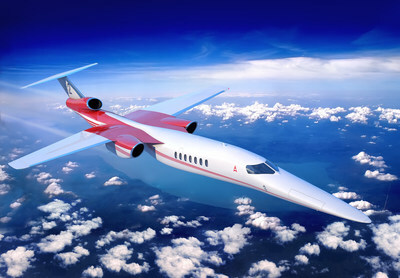 "The AS2 will revolutionize global mobility," said Aerion Chairman, Chief Executive Officer, and President Tom Vice. "We are proud to partner with Spirit AeroSystems. They are a leader in aircraft composite structures and we are excited that they have joined the AS2 team." Spirit expects to immediately begin preliminary development efforts. Aerion's 12-passenger AS2 is up to 70 percent faster than today's business aircraft. Supersonic cruise speed is Mach 1.4, about 1,000 mph. It saves as much as three hours across the Atlantic and more than five hours across the Pacific. Aerion is the industry leader in supersonic aircraft. The company is pioneering a new generation of efficient, economical, and environmentally responsible supersonic aircraft. The Mach 1.4 AS2 business jet is scheduled to begin flight testing in 2023. Aerion entered into a partnership with Boeing in February 2019 to develop the AS2 and advance the supersonic market. In October 2018, Aerion and GE Aviation unveiled the quiet and efficient GE AffinityTM engine, the first supersonic engine in more than 50 years.